UK Stampin' Up! 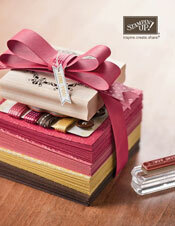 Demonstrator | make beautiful cards | Crafty Hippy: It's here!!! What we've all been waiting for!! The NEW spangly Annual Catalogue is finally here, and it's absolutely beautiful!! There are over 200 pages of goodies; the stamps are even better value for money and there are more embossing and die-cutting options this year. There are loads of close-ups and even mini-tutorials in the catalogue giving you even more inspiration. Stampin' Up! have introduced Suites (co-ordinating products) to take out the guess work and provide even more co-ordination and ideas.